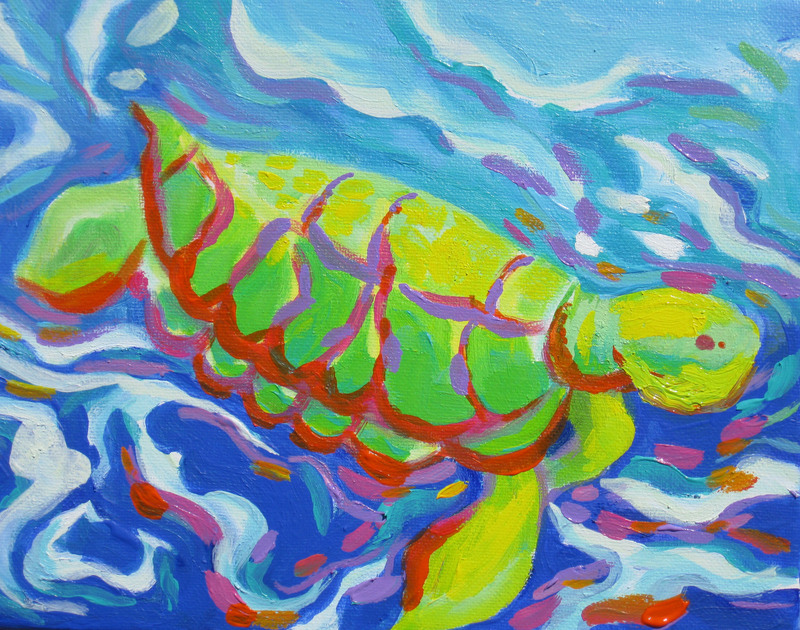 Private Studio Sale…shells and a crab! Thanks for your interest in my private studio sale this Christmas, here’s a few more special paintings from my studio that would make excellent gifts. These paintings are created with acrylic and hand embellished with ink and silver/gold leaf. Each painting measures 6″x6″ and comes framed in a black museum box frame. These can be sold together and would make a beautiful grouping, or can be sold separately. Please email me at kbunn@ec.rr.com if you are interested. Tuesday’s Treasure Chest………THANKS,this stuff is good! I love this time of year when there is so much cheerfulness and happiness in the air. I’ve been really busy painting and I am enjoying listening to Spotify as I paint on my Christmas commissions. I love those cheesy Lifetime and Hallmark Christmas movies too when I finally get to unwind in the evening. My hands are in water constantly and when I find a good thing I like to share, so I’m passing along a really good hand soap and lotion( like the soap better than the lotion)………from Bath and Body! The hand soap is so creamy and it’s whipped, it feels like you’re washing your hands with lotion, it’s not drying at all. As much as I wash my hands, that’s a plus, I might have to stock up on this and use it all year long! One more item to offer up in my Holiday Studio Sale, a “Lake Santa” 5″x7″ print, email me at kbunn@ec.rr.com if you are interested. “Lake Santa” easily fits into a 5″x 7″ frame and is reasonably priced. 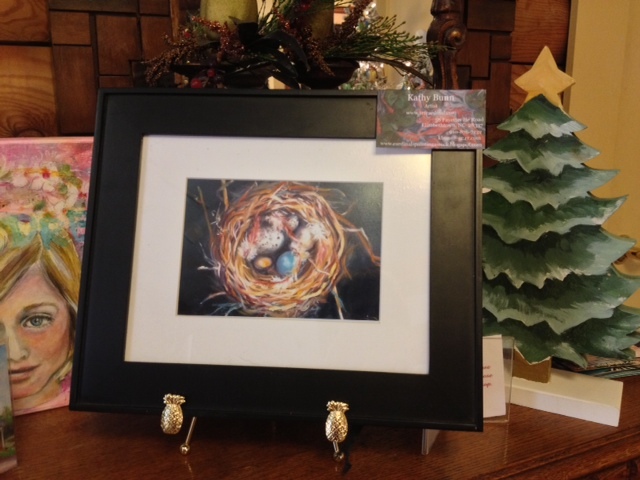 My easel is full this December and I couldn’t possibly take anymore commissions for now, but I sure can offer a gift certificate for a painting or have a special one created for you for a unique Valentine gift! Wouldn’t a beautifully painted yummy sweet cupcake be perfect for that sweetheart of yours? Thanks so much for following my blog, enjoy this time of the year friends! It’s beginning to look a LOT like Christmas, I found this snowman in my tree, she is drastically reduced and would love a new home! 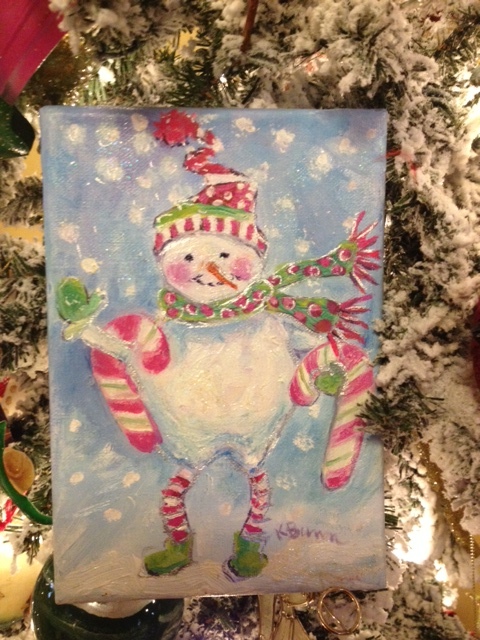 “Candy cane” snowman measures 5″x 7″ and is oil on stretched canvas. Let me know if I can help you with your Christmas shopping, I”ll ship it right to your door! Email me at kbunn@ec.rr.com for inquiries. 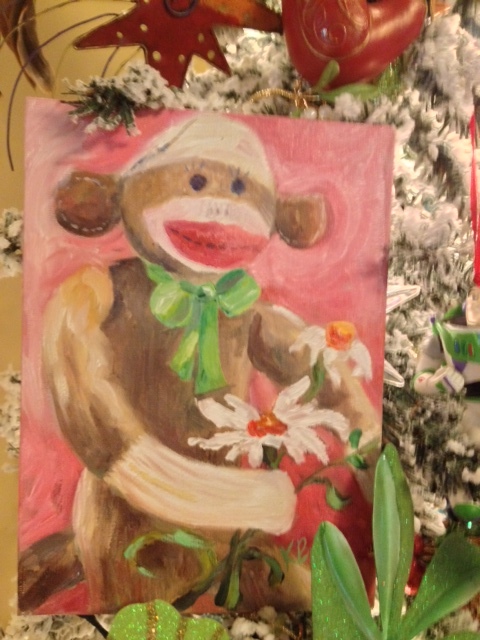 More paintings from my Holiday Studio Sale, here is one of the first Santas I ever painted, he’s a cutie! He’s painted with touches of silver and black zebra in the background. 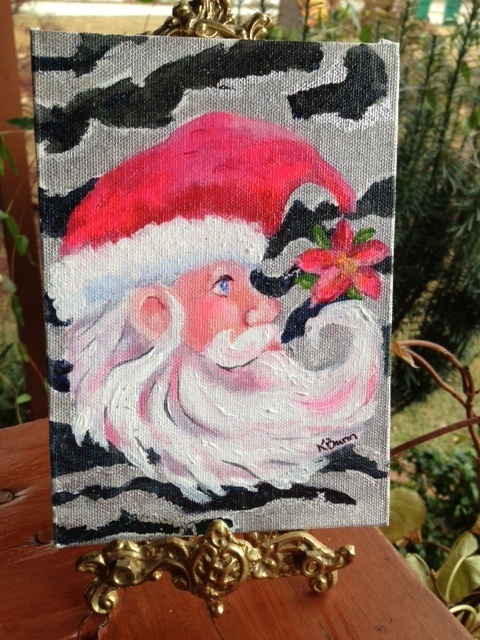 Zebra Santa measures 5″x 7″ and is painted with acrylic on canvas board. He is perfect for display in the bedroom, bathroom or in the den…….just move him about, he doesn’t mind! 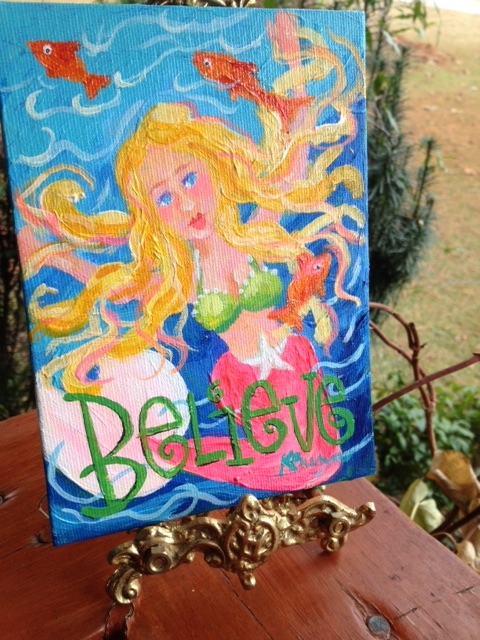 Mermaid “Believe” is a fun whimscial painting and would make a precious gift for a young lady, she’s also acrylic on 5″x 7″ canvas board and can be displayed wherever you like. Send me an email at kbunn@ec.rr.com , I can ship these right out to you!